Gamestream is an innovative cloud gaming company that delivers gaming capabilities to media groups, Telecom operators, hospitality agencies and game publishers, for customers without a console or a high-end PC. As a core part of their business, Gamstream’s on-site data centers required an infrastructure update to continue providing the high speed and high quality experience that their customers have come to expect. CTO Olivier Lebigot joined Gamestream 3 years ago, with the idea to build a cloud gaming platform based on quality user experience above all. With their unique technology and solution, it is not surprising that Gamestream had been growing quickly. They needed to scale rapidly while improving deployment infrastructures. Lebigot, understanding the importance of quality when it comes to gaming, took on enterprise switching products as a solution. However, it was soon obvious that, as their business grew, enterprise switches were not going to fit their rapid scaling business model because the costs were too high. They specifically needed a solution that was easily configurable, highly scalable, supported IPv6 and was high performance. Next, Lebigot tried using a smaller networking company, but ran into global deployment and transactional issues, and faced difficulty of getting equipment shipped and installed internationally which was diversely affecting their business by inhibiting their ability to get customers up and running very quickly. 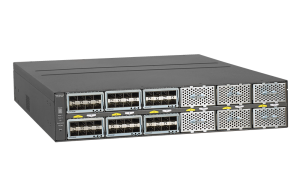 After working closely with NETGEAR, Gamestream has now successfully implemented nine M4300 Stackable Switches in two countries, supporting two of their largest customers. As a result, Gamestream has seen improved performance and ease of management, all at 20% of the cost of what they were spending before. The systems have been more than capable of providing the exceptional game streaming quality that customers have come to expect, especially their larger clients. From an operational point of view, execution time is imperative, and NETGEAR has been able to provide the support needed to get Gamestream’s global projects off the ground on time, and resolve their growing pains. 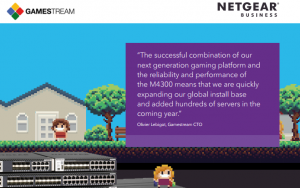 Later this year, Gamestream plans to continue deploying more M4300s to support their current customers’ growth (up to roughly 2000 servers). They will also continue developing their offering around the world. To read through the entire case study, be sure to download it here.